Irrespective of the profession you are involved in, to be considered a good and effective writer, you need to have a good command over spelling words. Spelling words correctly is one of the basic requirements of learning a language effectively, especially the written form. Whereas writing is the main skill, spelling is the sub skill. A person who is weak in spellings is likely to be perceived as a person who does not take his/ her work seriously, has a casual attitude and is not efficient in the language. It is easy to ignore spelling mistakes as it is the most neglected skill and gets hidden behind other skills such as vocabulary building, using idioms and expressions to make language impactful etc. A good speller is one who automatically writes correctly, while absorbed in the thought process, while expressing himself. Learning to spell well is important for good communication. Poor spelling makes a piece of written work less appealing and less effective. -A confident speller will be able to read and understand written material easily and efficiently. -Reading will be more fun. As a result, your reading, writing and spelling are likely to improve. -If your writing is full of spelling mistakes, other people may find it difficult to understand. The third point is particularly relevant to students writing exams. Spelling mistakes can change the grade of a student and be the difference between distinction and an average score. The rationale behind this is simple. If the examiner is unable to understand the words because of spelling errors, he/ she will miss out on the point being made and, hence, award less marks. This holds true for MBA entrance examinations as well. Since, these exams are timed exams, the possibility of aspirants committing spelling errors is very high, which can affect the aspirant's score. Therefore, the aspirant must be conscious of his/ her spellings and be mindful of this skill even during the preparation phase. 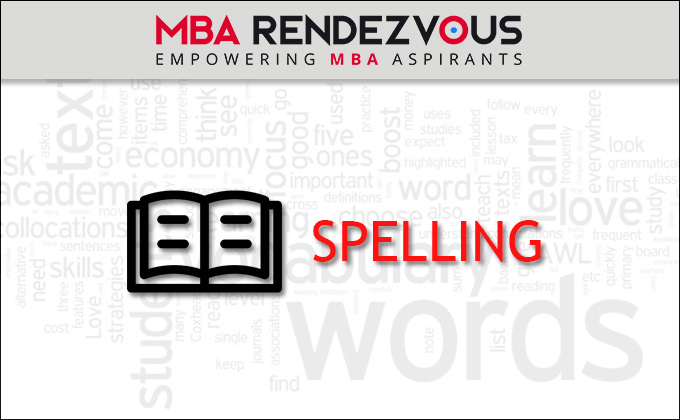 Realizing the significance of spellings, this module will discuss spellings in detail. the way a word is written-this relates to observing the shape and size of the letters making up a word and the way the words have been arranged. the way a word is spoken- this relates to observing the way the letters and the words come out of your mouth and the movement of your mouth as the words are spoken. the way a word sounds- this relates to the observing the sound that the letters and the words make. the way a word looks- this relates to observing the visual aspect of the letter and words, the way the letters combine to form a word. Breaking the word into syllables and pronouncing the syllables can ensure that you get the spellings right. Some useful spelling rules are given below to help you avoid making errors. There are, however, several exceptions to this rule. For instance, leisure, seize, heir etc. 3. When two words, verbs and nouns, which have the same pronunciation end in 'se' and 'ce' and 'sy' and 'cy', 'se' and 'sy' are verb endings and 'ce' and cy' are noun endings. 4. 'us' and 'ous'. Nouns end in 'us', Adjectives end in 'ous'. a. When the 'e' is followed by 'ment', it need not be dropped. b. When 'e' is followed by 'able', always drop the 'e'. Q1. Find below a list of words spelled incorrectly. Can you correct the spellings? a. I will _____ the job that you offerd. b. If someone offers to _____ the hatchet, it means they want to stop fighting. c. I would like some _____. d. I want to _____you for your delicious meal. e. I would not make a good surgeon because I have a _____ stomach.